Then the Devil went away, and angels came and cared for Jesus. It isn’t clear from the scriptures what time this occurred. I’ve set this scene in the early afternoon, with the sun on the left. The sun & the angels provide warm yellow lighting to this scene. Jesus (sitting in blue robe to the right) with 3 angels bringing food to him. 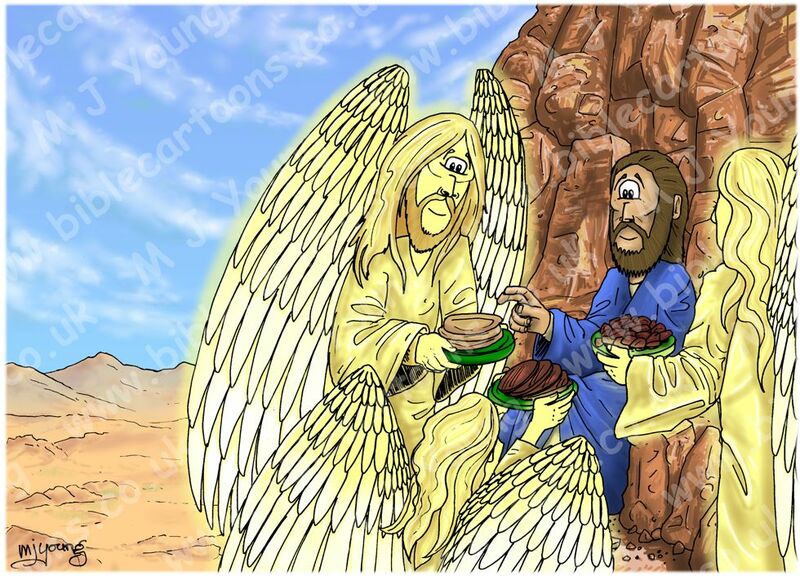 This is the last of the 6 cartoons that make up this series o the Temptation of Jesus the Christ. I have used the same background rocks & scenery from Matthew 04 – Temptation of Jesus – Scene 03 – Stones. 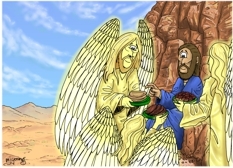 I think the angels saw to Jesus’ physical needs (perhaps bringing him food to strengthen him) & also his spiritual ones. I used to think that having defeated Satan’s three temptations, that the Devil left Jesus alone for the rest of his life on earth. But I think that Jesus probably had many encounters with the Devil, after this time, right up until his death on the cross. I can’t imagine that the Devil would ever have given up trying to tempt Jesus to give up his heavenly Father’s mission to save the human race through his sacrificial death & resurrection on the cross.